The Hutchison Chesser Community Centre, which is situated in the grounds of St Cuthbert’s School, is in need of extensive repairs in order to continue to provide a venue for local groups. The Centre is currently under-used and needs an injection of interest, support and funding in order to continue. The situation was discussed at an extra meeting on 15 January 2018 and the Community Centre Committee will be meeting soon to discuss options for the Centre’s future. Cllrs Gavin Corbett, Andrew Johnston and David Key have offered support but have advised that we would need to demonstrate how we can increase usage of the Centre, in order to attract the necessary funding from the Council. The outcome of their discussions will be on the agenda for the next meeting of the Hutchison Chesser Community Council, which will be held on the 12 February 2018 at 7.30 pm in St Cuthbert’s School. Contacting North Merchiston Club staff to ask if Hutchison-Chesser Centre committee can visit to see the set up there, and what it takes to manage it. In order to try to attract the funding for the repairs and maintenance of the Centre, we need local people to show their support by contacting us with their views and their ideas of how to make the Centre a viable venue for local groups. We would like to invite anyone from the community who is interested in helping to save the Centre to attend the next meeting on 12 February, to email or write to us*, or speak to our Chair, Harry Sutherland as soon as soon as possible. The Civil Aviation Authority (CAA) has temporarily halted its review of Edinburgh Airport’s airspace change proposal which will cause a pause in the process we are following. The CAA has sought clarification relating to technicalities in our proposed design and the co-ordination of air traffic control on a local and national level. This co-ordination, which sees NATS dealing with airspace changes from Glasgow and Prestwick Airports as well as ourselves has meant that the initial timescales we asked for from them are now no longer achievable. In terms of the design, we have worked hard to put forward proposals that responded to our consultations and minimised our impact on surrounding communities. It is robust and tested, however, in trying to minimise the impact on Cramond we have asked for a new design. It is clear we have more work to do to convince the CAA that this is the right design and that it works for the airport and Cramond. This is a hugely important decision for the CAA and we welcome its challenge. It is incumbent on all agencies involved to make sure the right decision is made for Scotland and we believe that if it takes longer than first anticipated, then it is worth it. We are working hard with the regulator and NATS to answer the further questions asked, provide further clarity and ensure that the analysis and assessment of our proposals restarts as soon as possible. We are confident that we can keep to our overall project plan and have our changes in place by Spring 2019. We’ll continue to work to that goal. In the meantime, we will issue the document explaining what we proposed and why, and hold the range of stakeholder meetings planned to accompany it. The first Community Council meeting of the autumn will be Monday 11 September, at 7.30pm. All very welcome. We’ve had a lot of feedback from the local community surrounding the Pentland House renovation. We’ve applied to extend the deadline for objections until 14 September to allow us to gather feedback from the community at this meeting. We’re awaiting confirmation that this request has been approved. We’d encourage as many local residents as possible to attend this meeting. Please note, we’ll be meeting inside St Cuthbert’s RC Primary School, and not in the Porta-Kabin in the playground. 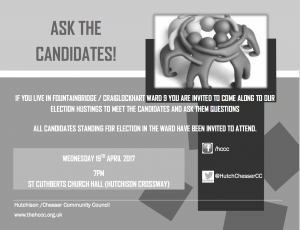 Join us on Wednesday 19 April at 7pm in the Church Hall of St Cuthbert’s RC Church (Hutchison Crossway), for an Election Hustings. All of the candidates standing for election have been invited to attend. This is your opportunity to ask them direct questions. Election Hustings are open to every resident of Ward 9. We look forward to welcoming you all. Open Spaces and Green Spaces. Local and citywide community groups and projects seeking to make improvements to our local environment are invited. Week-long exhibitions will be held at the same venue. They will open opportunity for contributors to input on local environmental priorities in next 5-10 years – all in the context of the emerging 2050 Edinburgh City Vision. Issues from these events will be passed to project teams for each Locality Improvement Plan – due out by October 2017. More information about the four Edinburgh Localities and Locality working can be found at www.edinburghcompact.org.uk/localities/ or email korstiaan.allan@edinburgh.gov.uk for a briefing. Please give us your views on what your priorities are for where you live and how we should change Council services. The Council has agreed draft spending and saving plans for the next three years. Based on this we now need to make decisions on how to change services. So we need to change how we deliver our services. We have already made some changes. We’re making better use of technology and working closer with our communities and partners, but we need to do more. Edinburgh residents have already given us valuable feedback on what’s important to them through our budget consultation and through ongoing involvement with local Neighbourhood Partnerships. You told us to protect education, care for older people, culture, and services for vulnerable children and adults. These continue to be our priorities. You also have told us you want to be involved in reshaping your services. This news story originated on the South West Neighbourhood Partnership website. Over December 2016 people in South West Edinburgh will be given the opportunity to vote on what community health projects they would like funded in the area. Before the vote, we’re looking to encourage as many community groups and third sector organisations as possible to apply, we’re open for applications between now and the end of October so if you’re interested download an application form or get in touch for more information. Projects will be for no more than £5,000 and must demonstrate how they meet the health needs of the community. Voting will open online on Monday 28th November, and launched at a health promotion event at St Martin’s Resource Centre in Dalry on 30th November. After that voting will be available in libraries, community centres and online. Results will be reported online, by email and by posters after the 21st December. You can keep up to date with future Grant a Grand developments by following the @Southwest_team Twitter and watching out for #SWHealthMatters. You can download your application form at the South West Partnership Website.